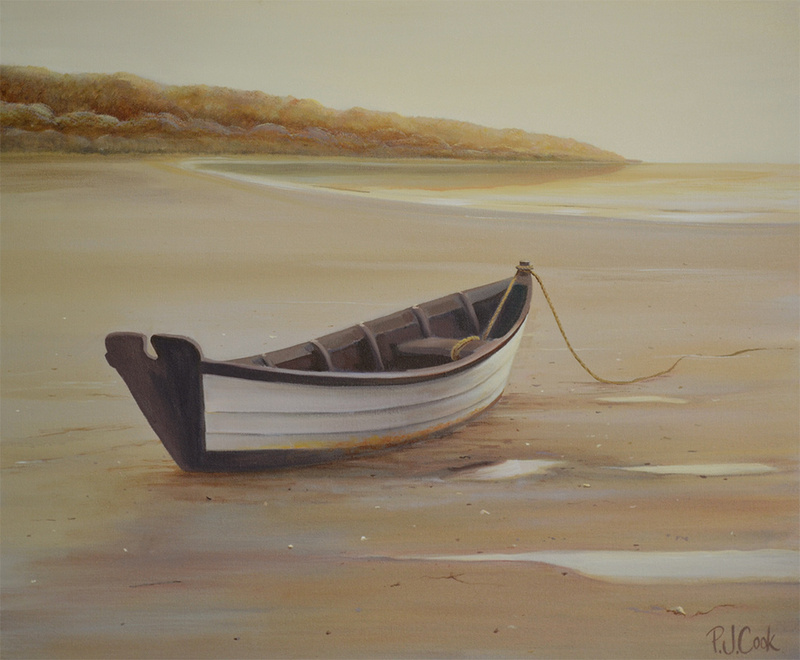 This marine painting features a nice wood dory sitting on the sand at low tide. The warm color from the setting sun evokes a calm mood with anticipation for another day on the water. This original oil on canvas is 24″ x 20″ and is available for sale. This coastal landscape painting was inspired by a scene I saw on Cape Cod of a dory in a bay at low tide. The boat looked like it was anticipating the incoming tide. The previous post here on my blog featured the oil paint sketch that I completed first in preparation for this painting. In that post I described wanting to use a limited palette. As you can see in the finished marine painting I used a very limited palette of browns and warm tan color.